A. Ryan Leslie ’98 is a singer, songwriter, producer and promoter whose accomplishments include graduating from Harvard at the age of 19 and releasing two albums in the past year. FM caught up with him after his keynote address at last Friday’s AMBLE Spring Media Careers Conference to discuss his work, his personal videographer, and his status as one of the 50 hottest bachelors in New York City. Fifteen Minutes: So how exactly would you describe your job right now? You seem to have millions of projects all moving forward at the same time, but what would you say is the primary focus of your career? A. Ryan Leslie: I would say that the primary focus of my career is to be creative. That’s it. To the best of my ability, to execute the creative vision that I have. That’s my job every day and it’s the job of everyone who works with me. FM: You entered Harvard at the age of only 15. What was it like starting college so young? Were you able to make friends? ARL: Yeah, I was able to make many lasting friendships while I was here. I believe that what was really incredible about the class that I came in with, as well as the other students at the College, was that they accepted me as a peer and so they made it very easy to fit right in as just another student. FM: Do you ever feel like you missed out on the high school experience? ARL: Well, the only point of reference I have to compare my experience to anyone else’s experience is what I see on television, and I’m told that what I see on television is pretty far removed from reality, so I don’t really have a frame of reference for what I missed. FM: As an undergrad, you were placed on academic probation three times. Were you not interested in your classes, or did you just feel like you had too much else to do? ARL: Very honest reasons for academic probation would be non-attendance of class and poor performance on examinations. I believe that stemmed from the fact that I was prioritizing the pursuit of music. Fortunately for me, I had a mentor who went to bat for me each time and was my advocate to the Ad Board. He was a Ph.D. candidate at the Business School and he ensured that I graduated on time. FM: If you were prioritizing music over class, what made you stick with it for eight semesters? ARL: I’m very driven to respect the wishes of my parents. This really means a lot to them that I did graduate from Harvard. It’s an accomplishment that no matter what I achieve in life, it’s an accomplishment that people respect because of the lasting legacy that comes along with a Harvard education. FM: Did your parents or mentors at Harvard ever try to talk you out of your plans to work in the music industry while you were a student? ARL: I believe that parents and people who really care about you, they want the best for you and they want your suffering and your challenges to be as minimized as possible. They definitely, I would say, advised me to be wary of that career pathway because of the immense personal and financial risks associated with pursuing a career in entertainment. FM: In your speech at Class Day in 1998, you said, “We are united in the wondrous power that we have as a collective body, the power to shape the world.” Do you think that you’re in the process of shaping the world right now? ARL: I feel like every day that is a driving force behind what I do. I do believe that through art, through music, through expression, we are always influencing and shaping the minds of those who consume that which we create. In that sense, I would say yes. FM: People always talk about the power of a Harvard degree. Do you feel that in your industry? 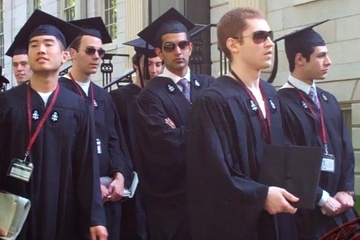 ARL: Saying I graduated from Harvard holds weight any time I say it, no matter what industry, or social or professional circle I’m in. I’m grateful for that, and proud of it. FM: What was it like working for Diddy? ARL: My experience there was very enlightening because it was an extremely concentrated dose of what it’s like to work in the music business. I’m a sponge, so I soaked up every moment of it: every tense moment, every moment under pressure, every demanding moment, I soaked it up. I enjoyed every moment as well because I have a really voracious appetite for knowledge about the industry, so working with him gave me a really firsthand opportunity to experience what it’s like in the thick of the entertainment industry. I believe that’s something that can almost only be experienced in that camp because, like me, he’s a workaholic and he’s very passionate about all of his professional endeavors. FM: Can you think of a moment when you stepped back and thought to yourself, “I can’t believe this is happening”? ARL: It happens all the time, even today. I step back and I can’t believe that I’m here at my alma mater being recognized by my own, so to speak. When I look at the power and the prestige and the accomplishments of my fellow panelists, I’m just really grateful. It’s all very surreal. FM: So you have a videographer here who films your life all the time. Explain to me your logic behind this decision. What do you think you’ve gained out of it so far? ARL: Initially it started as a way for me to share with my audience the ins and outs of what I do on a daily basis via a video blog. Now I mostly use it as an archive of the experiences that I’m having in hopes that one day, people will review this archive and will be inspired to live hard, love hard, and work hard. FM: In addition to the daily filming, there have been several tabloid articles in recent years about your personal life. Do you ever become frustrated by your lack of privacy? ARL: No. I really believe that once you get to a certain level of public exposure, people are just entertained by the lives of other people. Sometimes it’s more artistically represented, through film or through song, and other times it’s more literally represented through tabloids and reality shows and people are just as engaged. I take it as a by-product of the industry that I’ve chosen. FM: You were nominated as one of the “50 Hottest Bachelors” for Page Six Magazine in 2009. Do you try to cultivate this image or were you surprised by this designation? ARL: I actually didn’t know that I was on that list. I happened to be at an event for GQ and someone came up to me and said, “Hey Ryan, I’m the journalist that put that article together,” and I said “What article?” and she said “You didn’t see it? The 50 Hottest Bachelors of New York City.” And so, you know, as I said, my aim every day is to create the best art and creative media that I can create, whether that be through music, film, documentary film, whatever means of expression. If that passion is a characteristic of one of the 50 hottest bachelors in New York City, then I would have to say that, yes, I cultivate it. FM: Your album “Transitions” was reviewed by The Crimson earlier this year. Did you get a chance to look at the article? ARL: Oh yes, I did see that, and I wrote to that girl. FM: The review overall was pretty critical and definitely included some negative components. How do you deal with negative feedback like this? ARL: I’m into music so that people can enjoy it. I believe that critical reviews of music are necessary because it’s just as entertaining to read someone else’s point of view or perspective on a piece of art as it is sometimes to listen to that piece of art, so I have no problem with it. And I believe it was Meryl Streep who said that she stayed grounded by reading the blogs. FM: You used to sing in the Kroks here at Harvard. What would you think about producing a hip-hop remix of one of their albums? ARL: Well, I mean they’re a cappella, so I think that the Kroks really have a very specific musical message that would be compromised if we were to do a hip-hop remix. However, I would absolutely love to do it. FM: Where do you see yourself in the long term? ARL: Perhaps I live in a fantasy world, but I see myself in the long term living the way that I live for as long as I possibly can. There are those on my staff that say I have the mannerisms of a 17-year-old boy, and in fact I’ve had those mannerisms since they started six years ago. So I think I’ve done a great job of perpetuating my current vigor for expression and art and life.